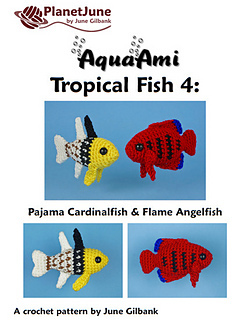 Two original crochet amigurumi patterns: Pajama Cardinalfish and Flame Angelfish, from the Tropical Fish range by June Gilbank. 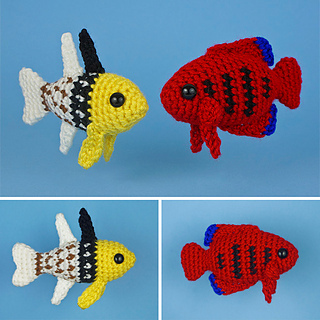 These mini amigurumi will hold your interest through their variety of shaping and crochet techniques that make each fish completely unique! Pajama Cardinalfish (Sphaeramia nematoptera). This strikingly-coloured spotted fish is popular in aquariums. The Pajama Cardinalfish hides a special secret to ensure the survival of its young - the male incubates the eggs in his mouth until they hatch! Flame Angelfish (Centropyge loricula). A beautifully coloured dwarf angelfish, the Flame Angelfish has a bright red, black-striped body and electric blue patches at the back of its fins. All techniques used include tips, step-by-step photos, and/or links to my online tutorials. 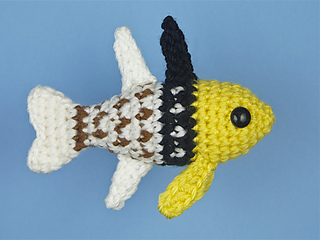 All the fins (the pieces that aren’t worked in the traditional amigurumi single-crochet-in-the-round technique) include charted stitch diagrams in addition to full written instructions, so you can follow the patterns in the way you find easiest. 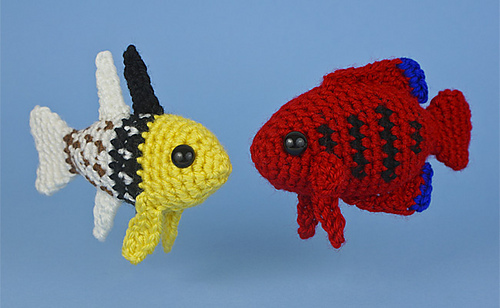 Note: Take advantage of the savings when you buy this pattern as part of the Tropical Fish Collection multipack, including all 8 tropical fish patterns! 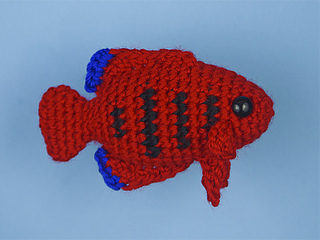 Update: If you downloaded this pattern before June 25th, 2016, please note that I've since updated the stitch marker placement instructions on the Flame Angelfish, to avoid potential confusion. You may download another copy from your PlanetJune account at any time - please email me (june@planetjune.com) if you need any help.